If you find your dog difficult to train and out of your hands, you can always enroll them to a dog training camp. 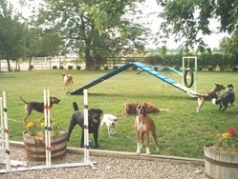 Dog training camps or 'doggie boot camp' is an institution or a school that trains your dog in intense methods. And intense doesn't mean harsh and brutal, still in a positive way, but in a way that your dog will learn the commands. These camps are for dogs that are hard to train, dogs who are out of control and take you for granted. Most camps last for a month or a few weeks, but some camps allow their dog to go home for the night. Most camps teach basic dog obedience commands like sit, stay, come, heel, and walking on the leash. Common behavior modification programs teach good manners like not jumping on people, not to bark excessively, not to dig your yard, not to fight with other dogs, etc. Aside from basic obedience commands, they also offer advanced obedience commands, crate training and other courses provided the cost. Other boot camps teach various courses like attack dog training, schuzthund, agility, personal protection, or tracking. Of course, good training camps trains a dog in a positive reinforcement, methods like praise and reward, clicker training, verbal and hand signal commands. Although some trainers do not support training camps for some training camps endorse punishment types. This doesn't mean that all training camps have punishment methods. Researching the camp before enrolling your dog may be a good idea so as to expect on what the dog will undergo during the schooling. Finding out the trainer who will then train your dog is also a good idea. These trainers manage the behavioral problems by creating programs that offer one-on-one attention with the dog, and exercise based training. Nowadays, many boot camps are created as many people tend to become busy and will have no time for training the dog themselves. Busy people are likely to enroll their dogs to boot camps to avoid hassle, and find training camps as a quick fix solution. Despite the dog training camps, the best way to train your dog is by yourself. Dogs are trained to be well-mannered and well-behaved in your household. So as you are given a responsibility by owning a dog, you must find effort to take care of them yourself. Also teach them in a good way, and not a negative one. Training them the wrong way may as well turn the situation around. Training them with your own is also a way to spend quality time with your pet, and strengthen the bond between dog and master.